Are you texting your customers? The data says that you should probably start. Although text messaging is the one channel many of us concede to 24/7, it has struggled to gain traction in the business world. It’s not immediately clear why — 97 percent of us read communications we receive through this medium, and we’ve been texting one another for two decades. As consumers, we like texts because they’re fast and efficient; 64 percent would rather receive a text than a call. And sales teams love SMS because of its power to boost conversion rates — when sent a text after an initial contact, customers are 112.6 percent more likely to convert. Text alerts offer a way to receive quick information, but they can also lead the user to more complex interactions. Transportation. Remember the days when you would call for a cab? After placing the call, you’d constantly look out the window, hoping someone would actually arrive. Then, after 30 minutes, you’d call the driver’s number and realize he’d been waiting around the corner the whole time. Now, thanks to apps like Uber and Lyft, the transportation industry has been completely disrupted. Users receive texts when the driver is on his way, when he’s nearby, and when he has arrived. Users can even get a text after the ride has ended, saying thanks and giving them a chance to offer feedback. Although these companies would prefer to use inexpensive push notifications to notify riders, push notifications require user permissions at install and can be disabled. Instead, they chose SMS; it works regardless of phone type or apps downloaded. Go where your customers already are. Banking. The financial industry doesn’t have a reputation for innovation, but it’s doing some pioneer work in the realm of SMS communication. While banking alternatives like RushCard have utilized SMS for years to allow low-income individuals outside of the banking system to manage their money, these systems are vulnerable to attacks and network issues. RushCard has already incurred scrutiny from the Consumer Financial Protection Bureau because some customers couldn’t withdraw funds for weeks. As a whole, the financial industry would do well to embrace SMS. Wells Fargo now offers its customers a “bank by text" model. By texting just a few letters, customers can know their balances (BAL ALL), check recent account activity (ACT), learn credit card due dates (DUE), and even locate ATMs (ATM + ZIP). Rather than asking customers to download an app, complete security checks, and wait for accounts to load, Wells Fargo customers can send a few characters and get the information they need. It’s a faster, simpler approach to mobile banking. Education. Educators know how difficult it can be to quickly reach parents. Parents need to see report cards, receive messages from administrators, and quickly learn about emergencies that involve their students. No medium is so widely read as SMS, and it can enable educators to reach dozens of students and parents with a single message. Texting can also be used to reach students who need extra support after school hours. Particularly during holidays, texting can help teachers and pupils communicate about difficult concepts. And, contrary to popular belief, texting has been shown to actually improve students’ foundational writing and communication skills. While app-to-app messaging services are blossoming in the consumer market, SMS is the future of business. Right now, only 25 percent of marketers say they use text communication, but 65 percent of those who do find the channel to be “very effective." In general, SMS is a great asset for a business that needs to reach a large number of customers fast. 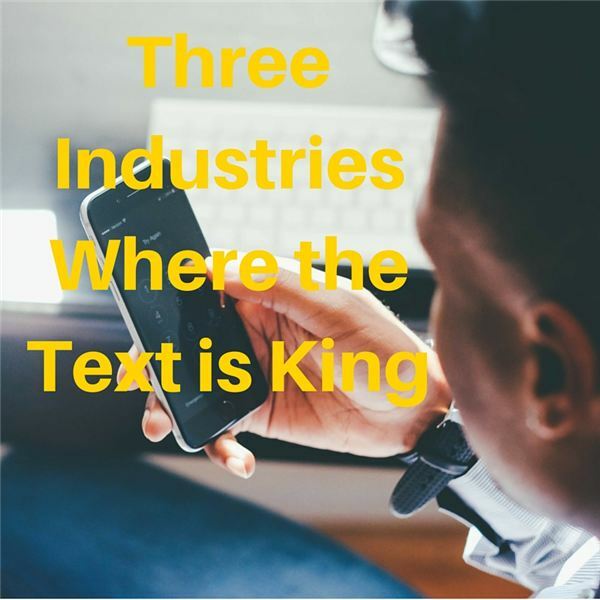 Texts are widely read, delivered instantly, and familiar to your team. Just make sure to familiarize yourself with the rules of texting etiquette to avoid any business blunders. SMS is the new email. As Millennials flood the workforce, and we rely more and more on our mobile phones, most of our business communication will soon happen via short messages, and the only channel everyone uses is SMS. Your industry embracing SMS isn’t a matter of if, but when. About the Author: Ash Rust is the CEO and co-founder of SendHub, a leading business communication company. He’s a coach at the Alchemist Accelerator. Ash served as an officer in the British Army before studying Computer Science at Exeter College, Oxford.